CG PPT 2019: Chhattisgarh Pre-Polytechnic Test is an annual state-level examination, the Chhattisgarh Professional Examination Board (CGPEB) conduct this exam every year to give the opportunity to all the eligible candidates to get admission in the state polytechnic government/non-government colleges of Chhattisgarh. Latest Update: CG PPT 2019 Registration closed on 14th April 2019. Admit Card will be released on 3 May. Latest Update: CG PPT Notification Released! Registration is already started on 26th March. We prepared this article to give all the information related to CG PPT, such as the exam, CG PPT Application Form, eligibility criteria, Exam date and syllabus. Let’s start with the basic details of the CG PPT Exam. All the candidates need to check the Eligibility criteria because without fulfilling all the criteria, candidates can’t fill the CG Polytechnic Application Form. Candidates must hold the domicile of Chhattisgarh state. The upper age limit for the exam is 30 years. Candidate must pass the 10th Board examination with minimum 35% marks from a recognized board. Applicants must have mathematics and science as a compulsory subject in their previous exam. 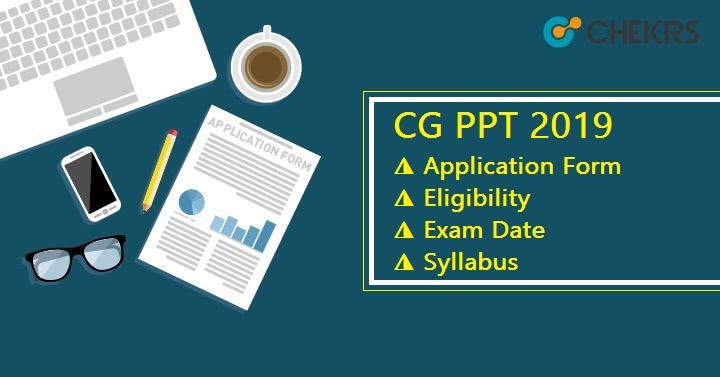 All the interested candidates can get all the information about the CG PPT Application Form on the Official website, so you need to check it on a regular interval. All the basic but important details of CG PPT 2019 are given here. The application form will be available only through online mode. Interested candidates can fill the CG PPT application form, between last week of March 2019 to 3rd week of April 2019. In the application, form candidates have to upload their photograph, signature and left-hand thumb impression. We request you to fill the application form very carefully because no correction will be allowed after submitting the form. Find and click on the CG PPT 2019 entrance exam and click on important instructions. You need to Read all the instructions carefully. After reading the instructions, click on online application form PPT. After it, you will be redirected to the online application form of Pre Polytechnic Test 2019 (CG PPT 2019). On the application form, candidates need to fill all the details, such as nationality, your name, gender, DOB, category, father’s name, mother’s name, email id, mobile number, and other required details. Fill the application form carefully because you can’t do any correction after submitting it. After uploading the images, you have to select the exam center of your preference. Check the filled-in details and Read the declaration and tick on I Agree. Now you have to click on the submit button to submit the CGPPT 2019 Form. After submitting the application form a registration Id will be generated after the successful completion of an application form. You will also receive these details on the Email. After it, you need to pay the CG PPT Application Fee which is given below. After successful payment takes a printout of the filled-in application form. 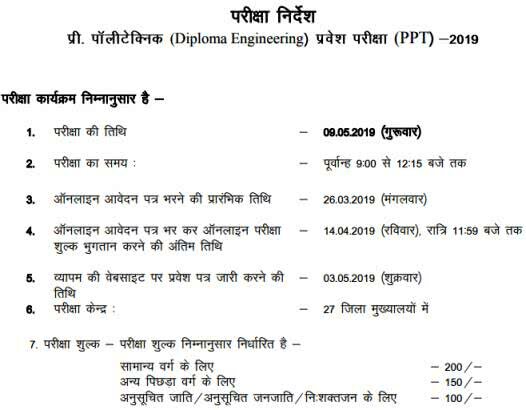 Here we are also providing various parameters of CG PPT 2019 entrance exam. The exam authority will provide the complete syllabus online on the official website. The CG PPT 2019 Syllabus will include 10th class physics, chemistry, and mathematics subjects. Candidates can study as per the latest prescribed syllabus which will be available online, on the official website. CG PPT Hall Ticket will be available online in the 2nd week of May 2019. Candidates can access and download the admit card by entering the candidate registration ID. CG PPT 2019 Results will be uploaded and released on the official website in the 2nd week of June 2019. Aspirants can download their result by entering the roll number. The CGPEB will also release the CG Polytechnic Answer Key and a separate merit list through online mode. Candidates can check answer key after one week of the examination. According to the merit list candidates will get admission in the various polytechnic institutions within the state. Counselling process in CG PPT 2019 will be organized through online mode from the last week of June 2019. In this process, all the qualified candidates have to fill their choices for stream and institution. After that Chhattisgarh Professional Examination Board (CGPEB) will allot the seat to the students, on the basis of, performance in exam, choices filled, and availability of seats. In this CG PPT 2019 Counselling Process, all the qualified candidate have to bring the original documents for the verification. At last, I want to include some Preparation Tips for CG PPT 2019. Plan and manage your schedule (Time and Subject) smartly. Use books by the good publishers. Solve previous year papers and model papers. Sleep well and eat well. CG PPT is conducted by CGPEB every year. It is a state level exam which offers engineering diploma courses, in the state polytechnic government/non-government colleges of Chhattisgarh. It is a great opportunity for all the interested students. So make sure to stay updated about this exam. If you have any query regarding CG PPT 2019 then drop in our comment box, we will get you back soon.